Naan is one of those eats, which gives an impression of restaurant-only type. For long, I was guilty of that misconception too, partly because back home typically nobody owns a Tandoor (coal-fired clay oven generating very high heat, up to 800-900 F) in which naans are made. Well of course you may find them in some homes in the state of Punjab, where this type of cooking originated. But rest of us depend on restaurants, big and small or Dhabas (eating shacks typically found in the outskirts of the city, or on highways) that are equipped with these ovens. But there are creative ways to get close to Tandoor cooking in household ovens or gas stove tops. In fact I had two recipes one using yeast and the other with baking soda, which I have been wanting to try for a long time. And in the name of research I tried them both. Both turned out to be good, although I preferred the one with baking soda, as they were softer and puffed up more. It simply boils down to what you have on hand or if you prefer baking soda over yeast. The best part of making naans is that there are no expectations on what the shape should be! The slightly elongated shape seen traditionally is obtained as the flattened dough is stuck to the Tandoor walls to bake on radiant heat. You can elongate your naans to get that Tandoor cooked look. Definitely a positive for someone like me, who is terrible in rolling dough into perfect (or even reasonable) rounds. You will have to crank up the oven to its highest heat setting, 500 F in many. If you can really get your oven to higher temperatures, your naans will be much fluffier and softer. I doubt that my apartment oven reached that heat although I had it all the way up. If that is the case naans will need a bit more time in the oven, at the risk of them drying out. But that can be minimized by brushing the naans on both sides with water prior to baking–which is what I did and got great results. For that reason, the exact time in the oven varies, so with the first naan in the oven get a feel for how long it would take to nicely brown on the bottom. You would need about a minute on the other side. *Quantity of milk may slightly vary. So add half the milk first and add the rest as necessary. Mix flour, baking soda, sugar and salt. Make a well in the center of the flour. Add baking soda, sugar, salt, yogurt, milk and oil. Mix well until the dough reaches a sticky consistency. The dough will be messy! Slightly oil your hands, form the dough into a ball and let it rest for 30 minutes under a damp towel. Once rested, the dough will be springy. Oil your hands and knead for 2-3 minutes before dividing into 6-8 balls. Dust your hands with flour and flatten the dough into naans. Try to keep them under 1/4 inch thick. Don’t fret about the shape. Brush one side with water and place them on a non stick cookie sheet, with water side down. Brush the other side also with water, add the desired toppings and put the naans in the oven for 2-3 minutes. If your oven heats up well, you may need only 1-2 minutes. Keep an eye until you get a hang of it. Check the bottom and if you see brown spots, turn them over and bake for another minute. Once out of the oven, rub them with a stick of butter and serve immediately. If you are not serving immediately, you can reheat them in the microwave, brush with butter and serve. Tandoor or no, those those wonderful! 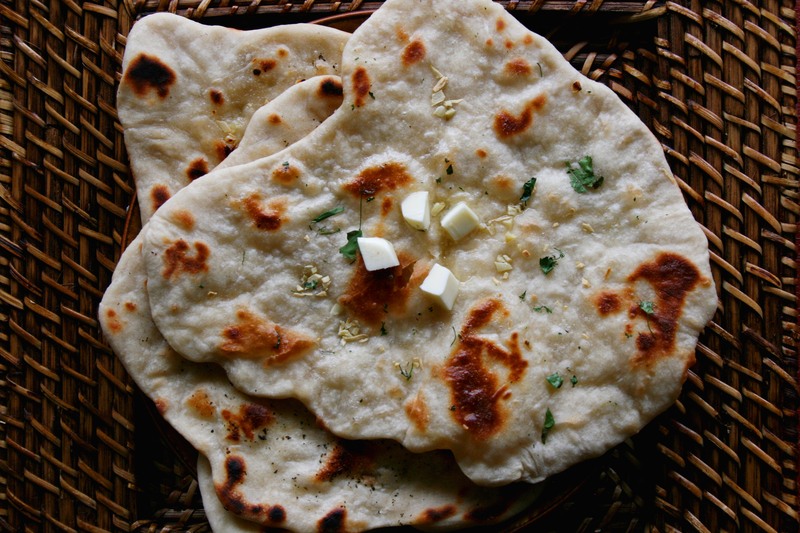 Love naan but have never tried making them before…going to give your recipe a try. Thx for sharing! Asiya, give it a try. It was much simpler than I thought it would be. Very impressive – this must be the prettiest naan I’ve ever, ever seen. 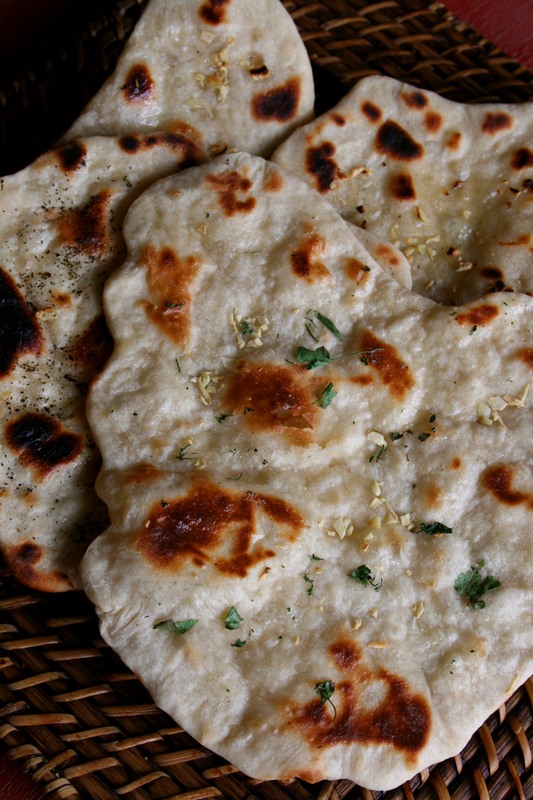 Love naan, and can’t wait to try your recipe! Ah, my favorite flat bread of all. Nothing approaches a good Naan. What is the oven temp. for Naan? Sorry for replying late. Crank up the oven to its top temperature rating. Some go up to 500 F, but mine went up to 450 F. The higher the temp the better it is for naan as traditional clay ovens go up to 800 F.
I made this naan and your chicken masala recipes this week and they were INCREDIBLE. I’ll definitely be trying more of your recipes. Thank you so much for all the deliciousness and help! Melanie, really happy you liked it. Please stay tuned for more that are on the way. I love naan, too! I’ve tried making them at home too! But this recipe, I will have to save and try. Do you know if baking the naan on a preheated pizza stone @ the highest temperature work as well? Hmm…never thought of that. Sounds like it would work, if you take care so that the dough did not stick to it, perhaps. This looks delicious. Gonna try this soon. Connie, I appreciate your kind words. Love to hear your feedback on the recipes! So I made these tonight and it was a total disaster. Did not turn out at all 😦 where did I go wrong? Was like eating cardboard. Oh boy! I am so sorry to hear that they did not turn out well. I make them the same way, and they always turn out fine. I really can’t say why your’s did not:( May be the oven temp? I only guessing! Sorry again!! This didn’t work for me either. Tasted like a flat heavy biscuit. Could I cook this on a BBQ to get more charred effect – or do you think it might get stuck on the grill/flatgrill? ?